Download my Body Window eBooks from my bodywindow.com webpages and you will be able to enjoy reading in a clean, easy and comfortable PDF format! Please note that if you purchase an eBook you will not receive anything in a hard copy format. These are digital products only! It is so true that you must first desire health, in order to be healthy! Healing only begins when you are ready to put your time and effort into it. You only reap any benefits as a direct proportion to the time you spend on it. I have now made it much easier for you to access all the extensive information on my website for your own personal health and healing, by creating eBooks! You may find, like I do, that it is more difficult to keep the flow of your concentration when you read webpages, than when you read the same information in a book format. Book format is much more comfortable a format, than web pages! If the prices of my eBooks are a deterrent, you can always continue read my extensive web pages without charge! The material is essentially the same. Why Should I Buy a Body Window eBook? As stated above, the flow of reading is best when no interruptions are included, like having to click on continuing pages, or having to try to find information, by clicking back to something you already read and want to review again. Sometimes we just get lost in the maze of clicks. There is no advertising or other distractions in my eBooks, just information, in book format, to keep your flow of total immersion going. Ability to read your desired pages when you are offline, like when you are traveling on an airplane, or when there is no connectivity, or you have limited WiFi or data. Convenience of a PDF file, that you don't have to organize, or print page-by-page for yourself. I have already done it for you. It is all ready to download and read or print immediately! Printing from my eBook is clean, and without any sidebar or ad distractions. Some folks just prefer the printed page! You will support my website and its mission to provide a donation-based coaching service for those in need, but without the means to pay for such services. *****Please note: When you purchase and download one of my eBooks, you are agreeing that you are in good health, and that you have been cleared by your Primary Care Provider to perform Yoga. The BodyWindow.com accepts no liability for your practice of the Yoga that is contained in the eBooks, below. 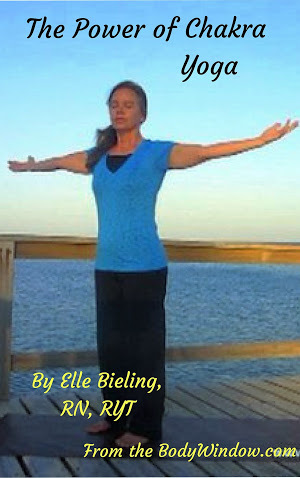 The first of my eBooks that I offer is a compilation in PDF format, of my Yin Yoga web pages. 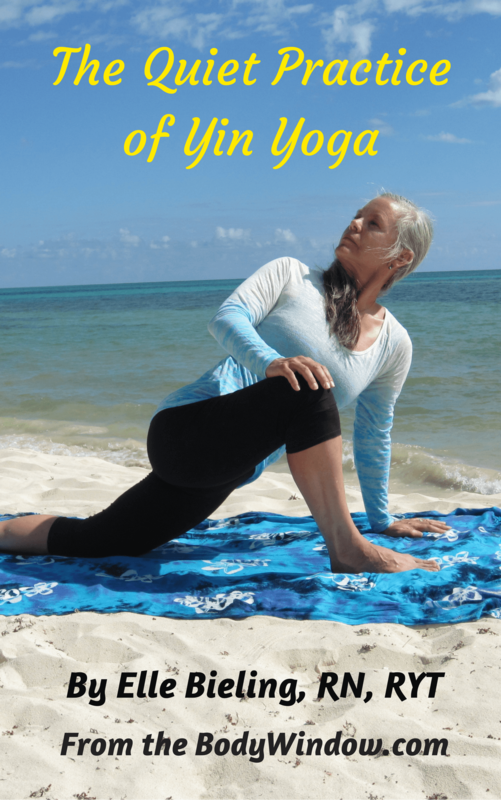 In one complete book, you will have a ready reference for all the Yin Yoga poses that I know. There is no form of yoga more healing than the Yin style. Over 125 pages of information on how each pose will affect what body system, which joints and muscles for special needs targeting. The second of my Body Window eBooks that I offer is a PDF file of my Chakra Yoga web pages. This is the eBook for you if you are interested in further understanding your body's subtle energy systems and how it impacts your health. It contains 45 pages, fully packed with all the information you need to know how to assess your own energy areas of need. May you always commit to your heal and healing, and use the Chakra Yoga, Body Window eBook to help you learn how to prevent any health issues that manifest as a result of closed or blocked subtle energy in your body! If you do having health issues, learn how to unblock the specific energy area for healing! Or you can contact me, and tell me which pages you would like to see me offer as an eBook, and I will respond to your wishes!